President Uhuru Kenyatta receives his Ugandan counterpart Yoweri Kaguta Museveni at the Moi International Airport in Mombasa. Uganda's Yoweri Museveni will on Wednesday start a two-day state visit to Kenya. He will be hosted by President Uhuru Kenyatta at State House, Mombasa, where the two leaders will hold bilateral talks and a joint press briefing. 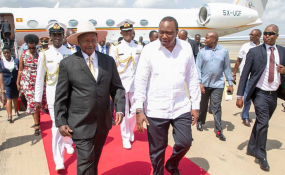 "During the two-day State visit, President Museveni, accompanied by his host President Kenyatta, will tour the port of Mombasa," State House Spokesperson Kanze Dena said in a dispatch to newsrooms. The visit comes amid tensions between Uganda and Rwanda who are involved in a diplomatic row. Rwanda accuses Uganda of arresting Rwandans, disrupting regional trade and of providing support and space to groups Kigali considers enemies. But Uganda has denied all the allegations. Recently, Rwanda briefly closed its border with Uganda leading to massive losses for businesses. The escalating tensions prompted Mr Kenyatta to engage in shuttle diplomacy on March 11, when he travelled to Kigali and held talks with Rwandan President Paul Kagame. He then stopped over in Kampala on his way back to Nairobi, where he held discussions President Yoweri Museveni. "We are faced with some challenges as neighbours and as a region. Through goodwill and good intentions, we will resolve these challenges," Mr Kenyatta said in Kigali.